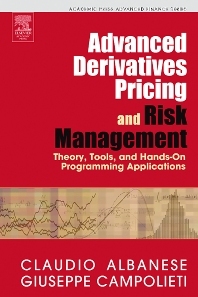 Advanced Derivatives Pricing and Risk Management covers the most important and cutting-edge topics in financial derivatives pricing and risk management, striking a fine balance between theory and practice. The book contains a wide spectrum of problems, worked-out solutions, detailed methodologies, and applied mathematical techniques for which anyone planning to make a serious career in quantitative finance must master. In fact, core portions of the book’s material originated and evolved after years of classroom lectures and computer laboratory courses taught in a world-renowned professional Master’s program in mathematical finance. The book is designed for students in finance programs, particularly financial engineering. Students in finance programs, particularly financial engineering.